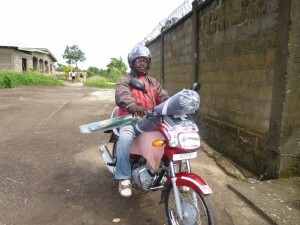 Bo has been Ebola free for more than 100 days. Cases in Freetown appear to be very sporadic and falling, under 5 new cases. Schools opened 14th April, so ….. time to head off to Sierra Leone. 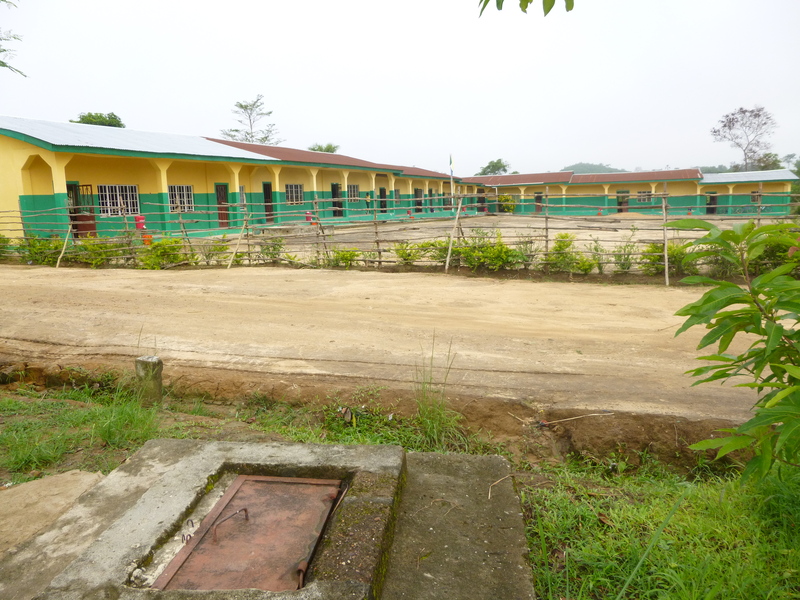 OAKS School, Mendewa, Tikonko Chiefdom, Bo. New classroom & store on left. Previous extension, bottom right. No direct flights from London due to Ebola, so decided to go via Brussels. Remarkably easy journey, but rather long. Manchester for just after 4.30am, flight at 6.30am, a short hop & then waiting around until 1.30pm, eventually arriving in Lungi, Freetown at 6pm. 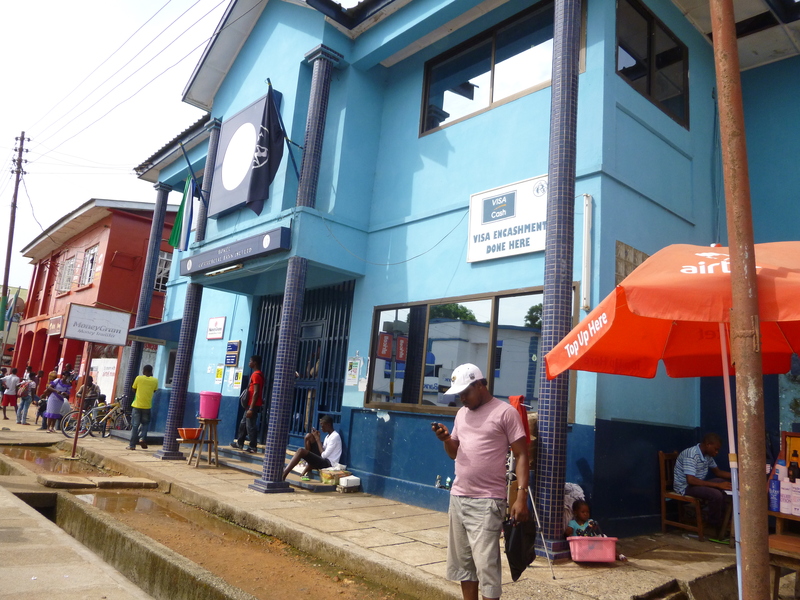 Belgium GMT + 2 and Sierra Leone GMT. Long transit through airport. Lots of checks at passport control. Medical form to complete and queue for temperature check – no-one bothered about Yellow Fever documents on this occasion! In the queue, ferry in the background. Boy am I tired! Bursar Mr Jarrett waiting for me – such relief!! Joined a long trail of vehicles for the ferry. It left just before 9pm. Eventually reached private house destination in Freetown about 10.30. Torchlight as the generator refused to work! Bread & 2 sections of cream cheese, ‘La vache qui rit’ for tea! Real 5 Star Travel. There were many police checks en route, each time our temperature was carefully checked. Officials are keen to put this virus to bed as soon as possible. Slight drama. We had a flat tyre, it didn’t blow, I think a small split in the wall which meant it started to leak around the rim & was deflating. Quick wheel change, ‘pit stop’ for me, in the bush & we were off. Arrived at school 1.30pm just before the end of their day. I was swamped by Class 2, who were on their way home. What a welcome! Very quick ‘hello’ & look into our new classroom, just great it’s finally being used. JSS 2 had a special song of welcome for me – very touching, all big smiles. Off to OAKS house, unpacked car & let poor Mr Jarrett off to have a shower & well deserved rest. It’s more or less a year since my last visit, so exciting to see the house. Also, my second family, Maggie’s nephew Max and wife Angela with their 2 children Alusine 3 & Fifi 5. Maggie’s wards, Alusine 13, Fatmata 11 and Eric 8. 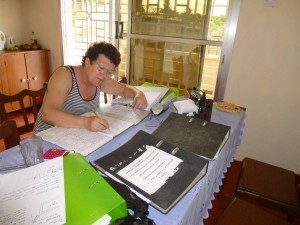 Plus Emma 26, Maggie’s protégé, from Gendema who earns her living cooking, selling food and hairdressing. 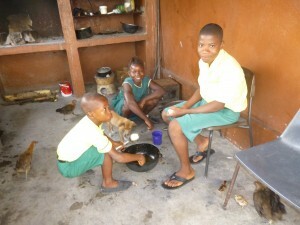 Eric, Fatty & Alusine in outside kitchen eating breakfast before school. Sharing with dog & hens! 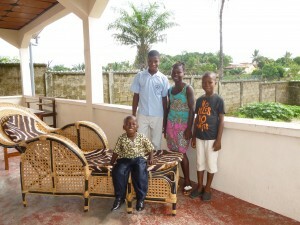 Alusine, Fatmata & Eric leaning on veranda wall with young Alusine on lounger. In their Sunday best. Head teacher Joe popped in for a chat late afternoon, explaining he’d be absent from school the following day, Friday, a family funeral to attend. Teacher Francis Rogers would also be absent, his wife had died and he’d many things to organise in Freetown. Funerals are culturally a big deal, hence the rapid spread of Ebola. Fantastic, eventually a proper meal Thursday evening and a large brandy to celebrate – I now feel as if I’ve arrived!! Alpha, the caretaker, has a digital temperature reader, everyone is checked. First full day at school reveals how Ebola is still impacting on everyday life. A manned gate. Caretaker Alpha with his temperature gauge, every person who enters is checked; then hand washing in heavily chlorinated water. After assembly the pupils must wash their hands again as they enter the classroom, this ritual is repeated once more at lunchtime. I was also shown the ‘Safe Room’ where anyone who is sick or has a temperature is removed to await collection by a parent followed by hospital checks. 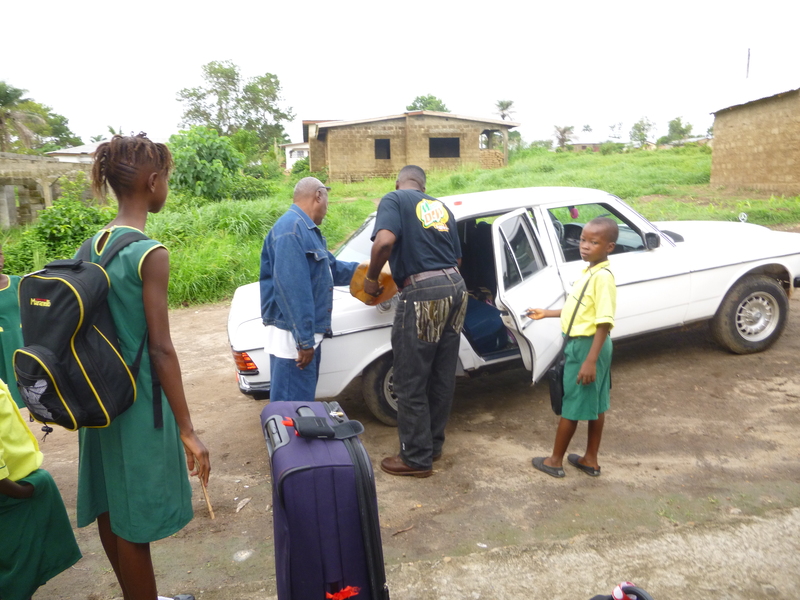 Deputy Head Chris Kawa had a scare with his son, summoned to collect him from school, via hospital to a special Ebola check point, fortunately blood tests eventually revealed, malaria…. All agencies are super cautious and tensions run high. 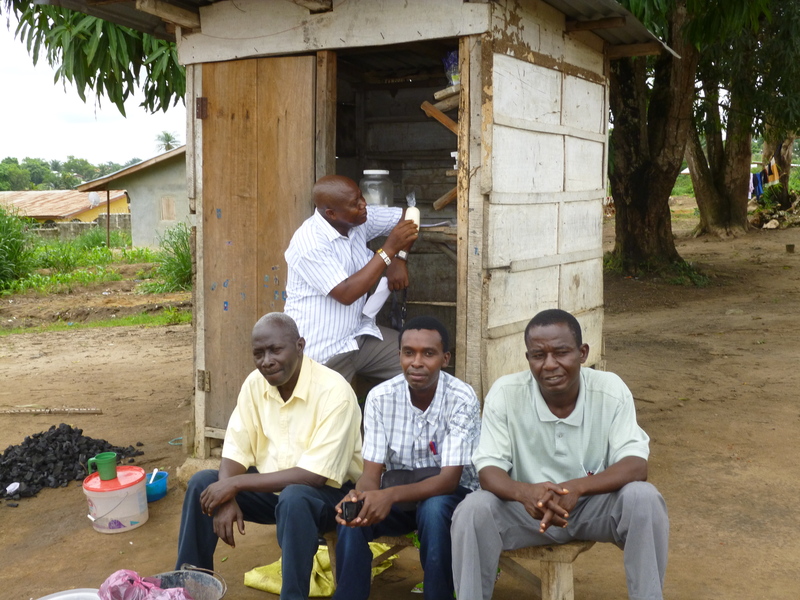 Everyone is eagerly awaiting the 42 day, no new cases, for ‘Ebola free’ status, it’s remaining illusive at present. Since my last visit we’ve lost three people related to OAKS, two young girls at school ‘severe asthma attack’ and ‘sickle cell anaemia’ as well as our local Chief Momoh aged only 37, from ‘pneumonia’. We really should greatly value our National Health Service. The pupils are as delightful as ever, so very pleased to be back at school, after 8 long months. All appears happy, calm and business like. 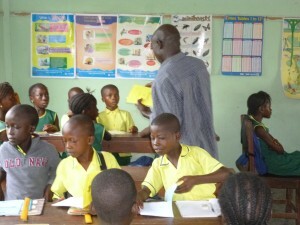 The reaction to this protracted crisis from the Ministry of Education is draconian. Instead of allowing children to ease themselves back in with a revisionary summer term, starting business as usual in September for a normal school year, they’ve decided April to July is a 14 week Term 1, 11 days rest, quickly followed by term 2, August to end of November. There will be no term 3. December begins a new school year term 1 through to mid-March, followed by term 2, April to July, again, no term 3!! Everyone will be expected to come to school during the height of the rainy season when it can rain nonstop for weeks. OAKS must buy all its staff boots and rain coats. Absolutely no idea why anyone thinks this will work, but the decision appears to be final. 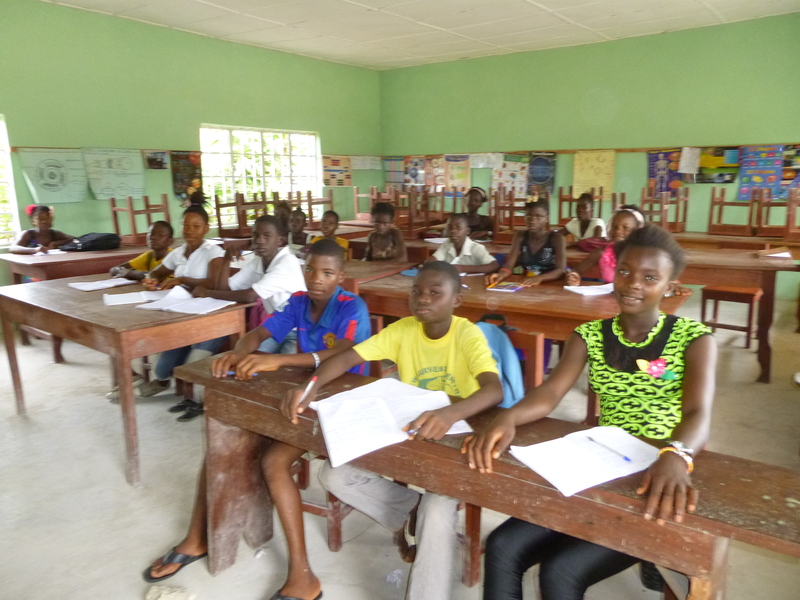 The much heralded exam, NPSE for class 6, September 5th, they will have just short of 19 weeks to prepare for a difficult 5 test paper exam, following a period when schools have been closed for 8 months. Does this make any sense?? My first full day at school was extremely busy, covering for absent staff, Social Studies and Agriculture, which includes Biology. 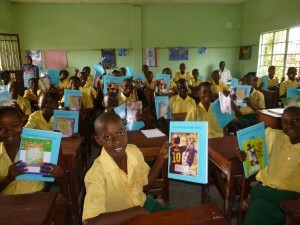 The kids were great, eager to learn, full of expectation and smiles. I was plum tuckered out at the end of the day. ‘Kitchen table’ charity. Ledgers and invoices – I certainly know how to have a good time! Mr Jarrett the bursar gave me my weekend homework, ‘the books’, dozens of receipt books, ledgers and files, what joy! Managed to sort all receipts, but his files didn’t go back far enough, August 2014 instead of May – that’ll be my treat for next weekend. I popped into school for Class 6 Saturday morning extra studies. Chris Kawa works very hard to get NPSE class 6 up to scratch for their exam every year. He’s really got a challenge on his hands this time, so very few weeks to prepare the pupils. 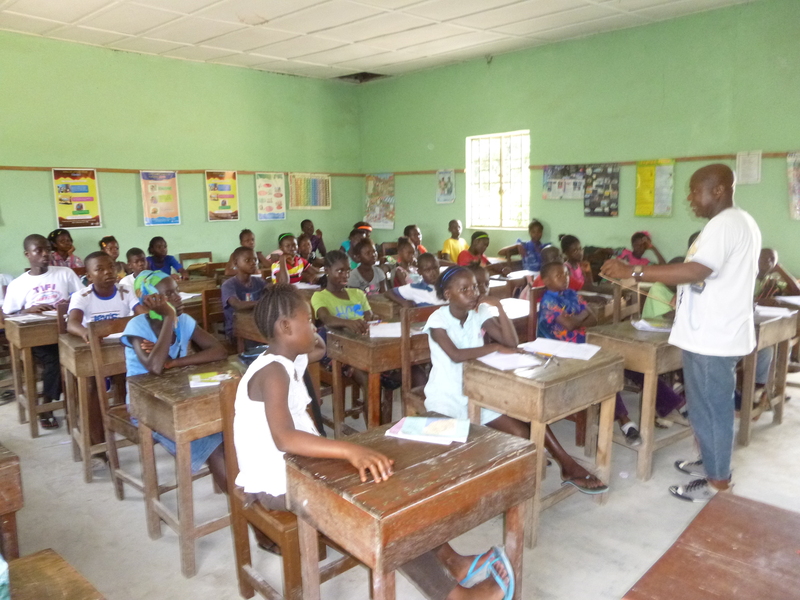 Eric Kobba was also in school, giving JSS2 an extra Business Studies lesson. I was called back to the school premises on Saturday afternoon to sign for a delivery of stationery from UNICEF, 3 big boxes. We had to carry them back to the house as the caretaker was off site on his afternoon break and the Head Master was away from Bo at a family funeral, no-one else had keys for the school store. The goods came on a truck with the Bo District school inspector Mr Sahr and even a policeman on board to lend some gravitas! 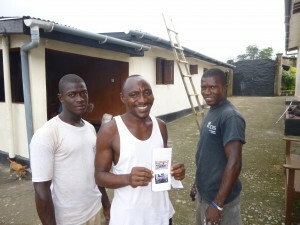 A happy Lawrence, they did get all the building jobs done & were rewarded with their picture in the newsletter! The builders arrived late Saturday afternoon to greet me, where upon I gave them a list of repairs, mostly left over from twelve months ago! Not sure how much will be completed before I go, difficult to pin them down, they’re long on promise and short on delivery. However, they’re keen to have OAKS latest newsletter with their pictures in, so, maybe I stand a chance to have my insect screens mended plus the more important roof & gutter leaks! Monday saw Joe Williams & myself checking UNICEF delivery and working out how to fairly distribute the materials amongst the primary pupils. Needless to say not everything on our delivery note was contained in the boxes, quite a few items missing, ‘The Sierra Leonean Factor’ at work yet again! 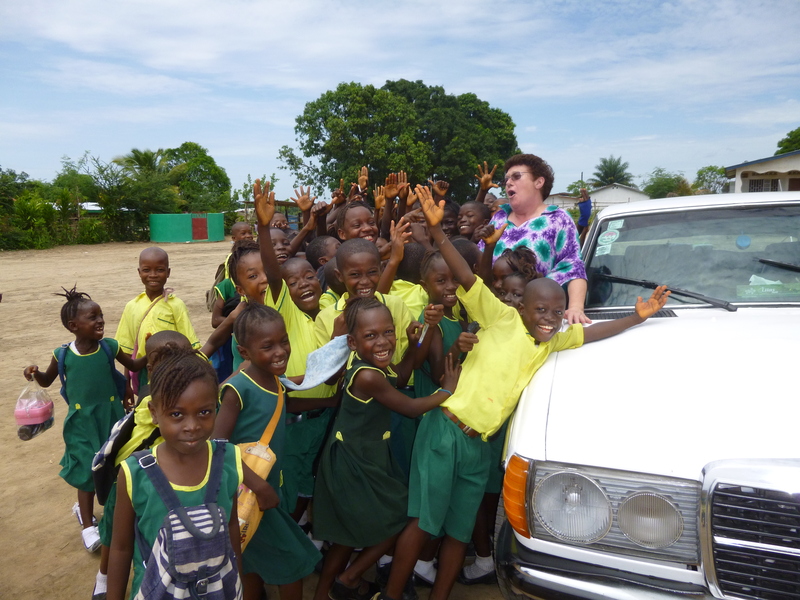 All pupils received at least an exercise book and a pencil in a robust plastic carrier/school bag. 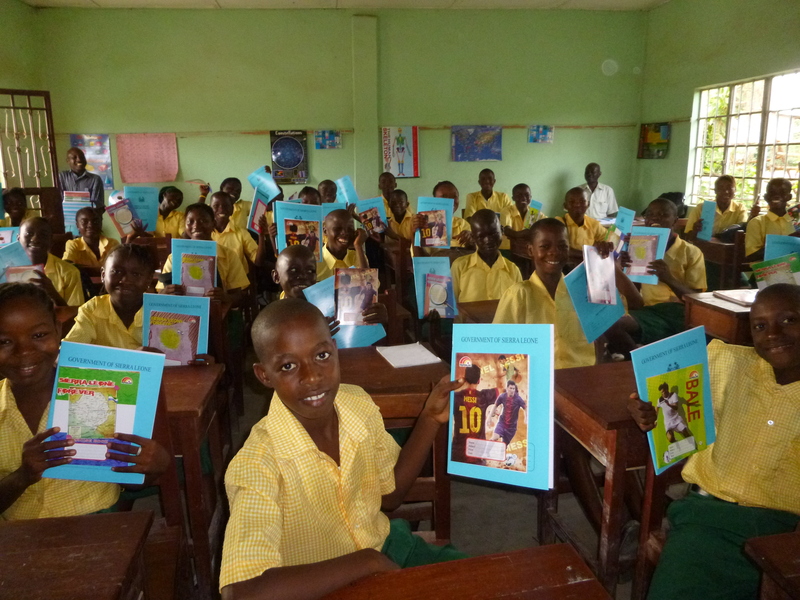 The older pupils had more writing materials minus the bag. Everyone was so excited. Something so relatively small was such a big boost to morale for a community and children who rarely get presents. A big thank you to UNICEF but with the cautionary note – please check that what you give is really delivered in full, rather than being siphoned off and sold! Lunch off site. Bassie, Mike & Patrick seated. Chris trying to look cool in the background. I met our newest recruit Bassie Samura, form tutor for Junior Secondary School (JSS) 1, charged with delivering RME (religious & moral education) plus Language Arts. He’s an ex ’Brother’, leaving the religious order to marry. He’s spent time at college in Staffordshire where he gained a City & Guilds! The Head Teacher and I both feel it’s early days, he needs time to settle in and to be treated to some ‘in service’ training. Lesson observations were organised for him on my last day, provided by his colleagues Chris Kawa, Mike Baio and me. I think it’s given him much food for thought. Tremendous pointer to life getting back to normal – a health agency nurse was in school to administer all pupils with their yearly dose of worming tablets. 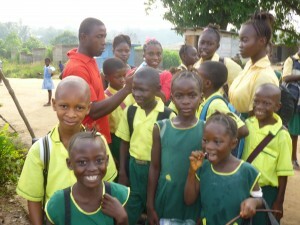 Schools are a marvellous conduit for Public Health initiatives. I spoke to the Deputy Director of Education (DDE) on my first Friday to arrange an appointment on the following Monday or Tuesday. Monday was agreed. 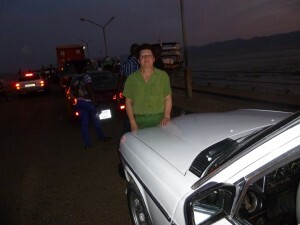 Mr Jarrett took me in the car, however, when we got there at 9.30 he was out, called to an emergency. 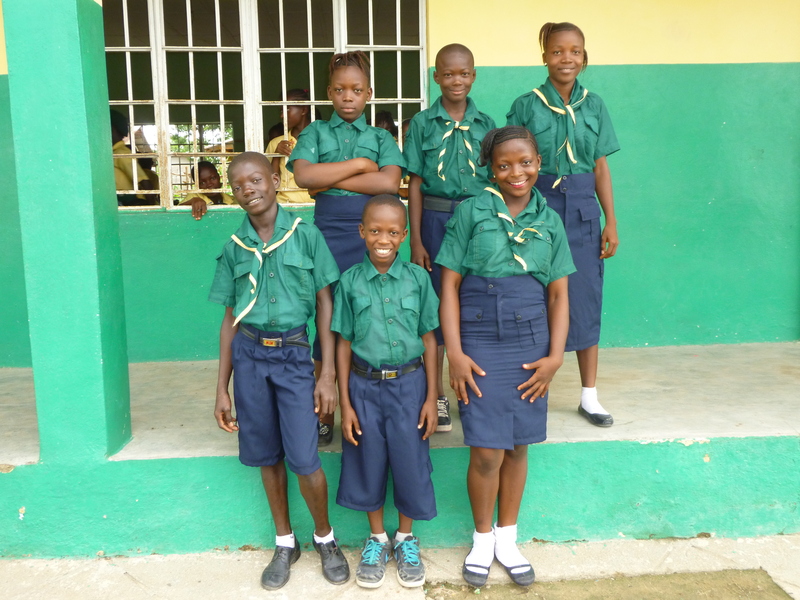 So, we went to the bank to collect the latest statement and then on to the school uniform material supplier to check out the colour tone, availability & price of scout uniform cloth. Material viewed for scout uniforms. I caught up with Mr Swaray (DDE) on Wednesday afternoon, I had to hop a Honda. Met up once more with ‘Mohammed – the bike’, he’s a very safe, cautious biker & he loans me his helmet! The Deputy Director and I passed pleasantries. I gave him a written critique of my thoughts on the proposed Government ‘crisis timetable’ and elicited his help in approaching the West African Examination Board (WAEC) for a resolution to our application for JSS Index Number. 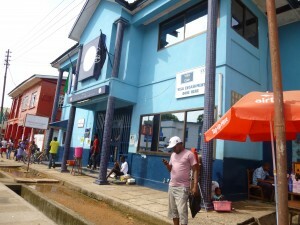 I first began this application via Freetown in March 2013! Nothing is straight forward. Staff training in Class 3 form room. Thursday was designated as staff training, but only from 11.30 onwards, time with the children is very precious on the current 2 term system. Training therefore was only about 2 hours. Due to the prolonged shut down, I deemed checking maths procedures were standardised throughout the age groups to be the most important, adding with carrying and subtracting with borrowing etc. Certainly proved to be a good idea and the group settled on common practise after much discussion and practical examples. The second priority was class notes fit for revision purposes, the focus on definition, charts & diagrams. Thirdly we re-capped lesson plans and the use of child knowledge and visual cues. 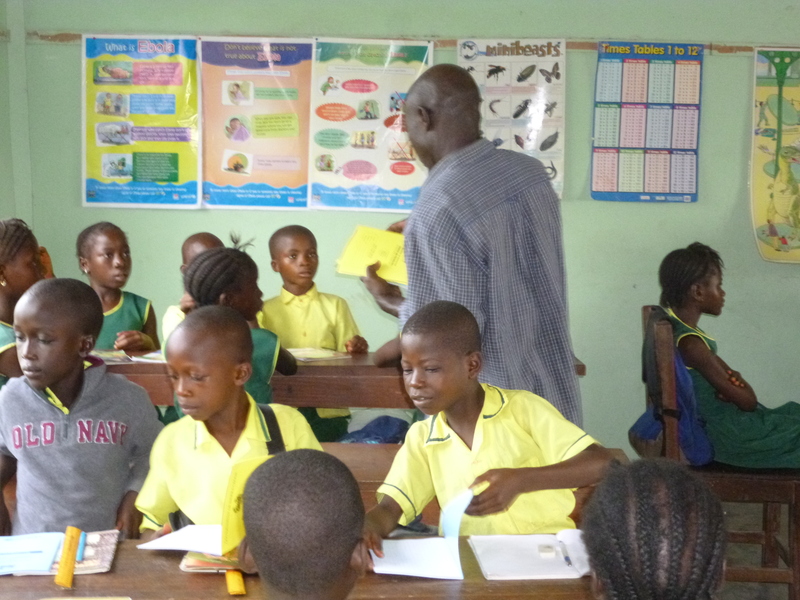 Time was also given to the discussion of a new member of staff for JSS3, November/December and the impact of the Government time-table for two shortened school years. Not all pupils can or will be promoted and the only leeway available to manage numbers is by reducing the intake to the new school year Class 1 and JSS1. Also, staff in conjunction with parental discussion can delay the pupil entrance into the NPSE (Class 6) & BECE (JSS3) exams. This is a problem which will have to be managed by all schools, we’ll just have to see how it unfolds. 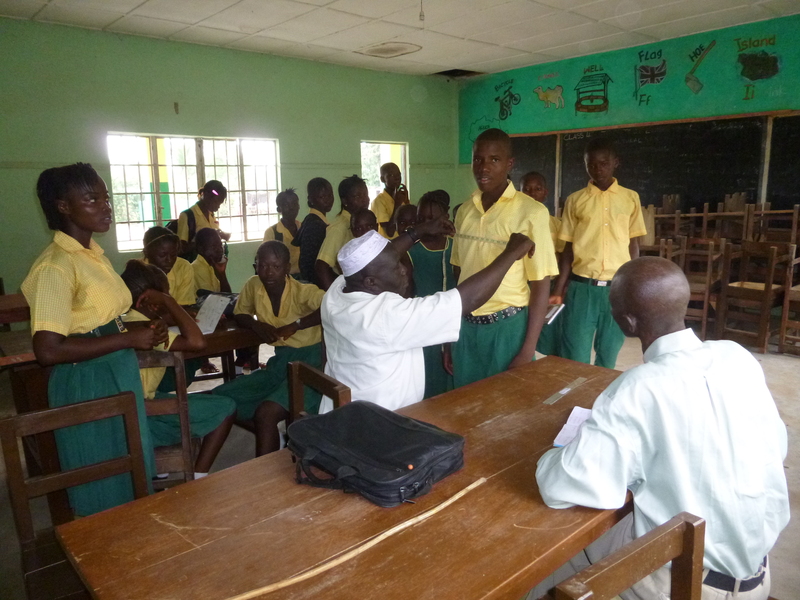 Scouts being measured for their uniforms. This room will eventually be for JSS occupancy in January. 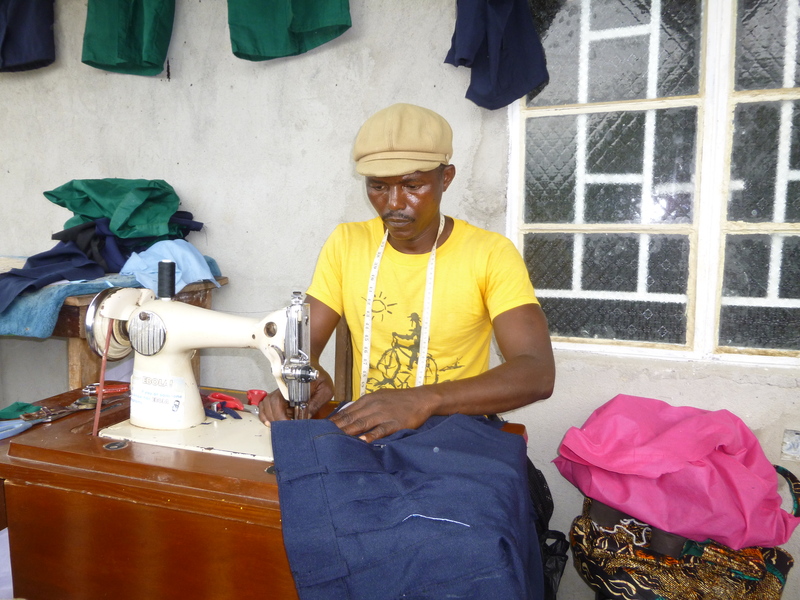 Friday, Joe invited a tailor into school to measure the pupils for their scout uniforms, 13 boys & 8 girls (5 boys & 1 girl already have their kit) – total 27. 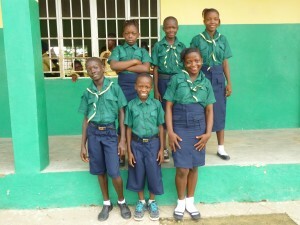 The scout leaders Francis and Alpha also to have khaki suits. The tailor was a nice guy, but his price was a bit high for ‘workmanship’ and he was not prepared to negotiate. We called in a local tailor recommended by Max. He required more material but his workmanship costs were much lower. Let’s hope I made the right choice. The tailor lives just across the swamp, with a family of 6 children to support, very eager to please, he hopes if he does a good job he will be awarded more work in the future. Saturday Max & I headed off to buy the material. Mohammed ‘the bike’ came to collect me. We returned with rolls and a large bag full of material. 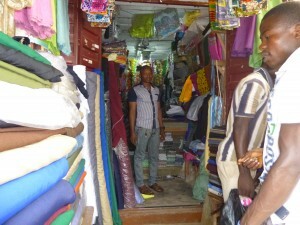 The tailor came to collect and promised 6 – 10 uniforms ready for my last day in school. Fingers crossed. The rest of my weekend was spent on the books. Mr Jarrett is a good book keeper, but he uses a method which suits him, which I find rather long winded – it takes me a little while to get it sussed. Cross referencing is more complex than it needs to be, but, all balanced with only one small mistake! Lots for the bursar and me to discuss in order to make auditing simpler. Long list of items to be located and photocopied in order for Nic to be able to audit and file our Charity Accounts. 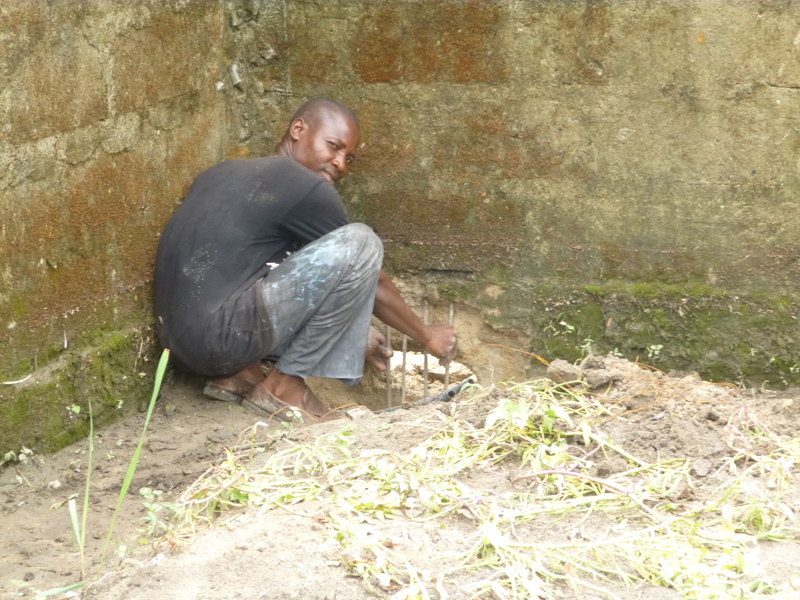 Lawrence, James & Mustapha, the builders arrived to organise drainage holes at either end of the bottom compound wall of the house, the land floods because water cannot easily get away and drain down to the swamp. The window insect screens were in shreds, caused by the birds pecking them whilst sitting on the metal security guards. To avoid future damage I had to buy mesh to cover the security bars; all this will hopefully be fitted on Tuesday, finished Wednesday. The gutters & three small areas of roof will be mended before I leave, I just have to provide some zinc sheets and filler. DDE John Swaray, Head Teacher Joe & OAKS school inspector, Martin Sahr – in OAKS school office. I was truly amazed, at long last, after four years, the Deputy Director of Bo Education (DDE), John Swaray, called to visit the school. He was shown all the facilities and introduced to each class. I’d loved to have been ‘a fly on the wall’ on his return journey to hear what he thought! He did tell me at a later date, a one word comment …. Wonderful!! I met DDE in town the following day at WAEC to sort out our registration for JSS exams. In the twelve months since my last visit & application to WAEC, nothing had been processed for us and now the rules have changed again! I had to write once more to Freetown requesting our official confirmation. The way the system works I don’t hold out much hope of resolution. 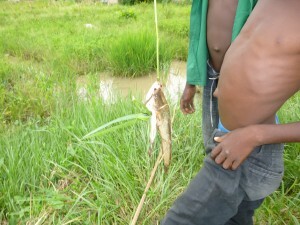 Time to contact DFID (Department for International Development) and perhaps the Sierra Leonean Embassy in London. My last Thursday was Parent’s Evening (CTA). There were about 20 parents at the start of the meeting, but the hall was virtually full by the end. 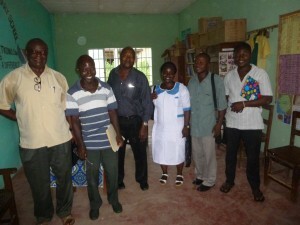 We discussed pupil progress and improvements to the building. Much time was devoted to the new government time table and how it would affect exam entrance and promotions. The new system of fines for non-attendance at the start of the new term in August was explained and the urgent reason for full attendance on the crisis management 2 times 2 term system. 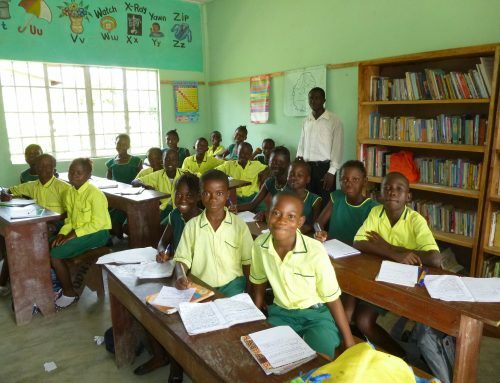 The JSS3 (year 9) BECE (Basic Education Certificate Exam) will take place in June 2016. I’m not sure how many pupils will be ready to sit this exam, having been deprived of 2 terms of teaching and studying time. JSS2. Head Boy, Head Girl and 12 prefects. Badges from Clare Mount 6th Form. 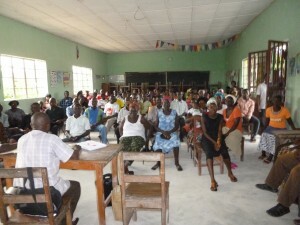 There were many topics for discussion & a multitude of comments from parents. 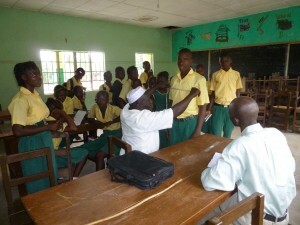 A lot of time was given to the introduction of prefects badges. The final broadside from a parent was why we hadn’t yet provided an OAKS Senior Secondary School!! A work in progress ……….. It’s time to become Government Assisted – they pay the wages and we do everything else. However, we’ll need our own UK government assistance to achieve this one – intervention on our behalf via DFID in Freetown. Friday Max & I walked across the swamp to visit the tailor. He was hard at work in his porch area. Tailor busily working on his treddle sewing machine. Think he’s trying hard to get everything perfect. No doubt there’ll be a few glitches and one or two alterations along the way. The boys have caught 2 fish in the swamp – amazing! 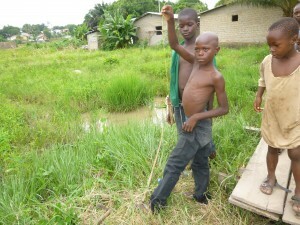 Met some boys fishing on the way back. I wouldn’t have thought you’d catch anything in the swamp! 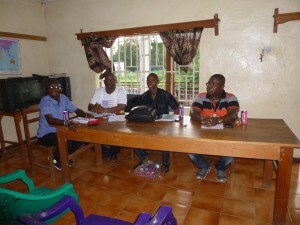 Scout meeting, chaired by Mr Tarawally, Head of Bo Scouts, seated far right. organise. There was much joy and kudos, Bo has been chosen as the venue for December 2016 Camporee – think this must be a nationwide celebration, no doubt find out more next time. School set up in a small house. Very small classrooms. school held in a house behind our compound known as Al Quadus. 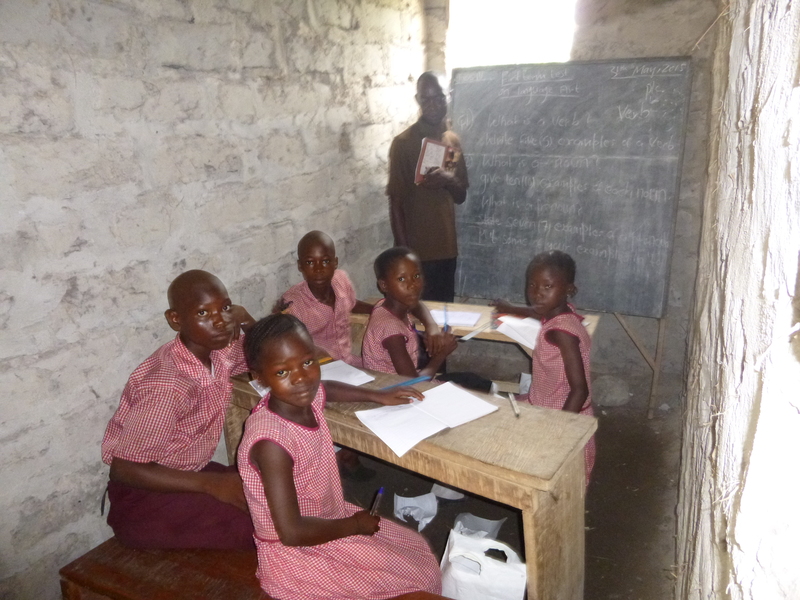 Very small classes and just 2 teachers, but, it’s Government Assisted! Monday was an SMC (School Management Committee) meeting, chaired by retired teacher, local councillor and member of Tikonko land holding family, Mike Baio Snr. It was a re-run of the CTA agenda but with more focus on facilities, exams and future development. SMC members. 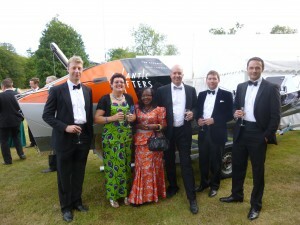 Mike Baio, Joe Williams, Rey Jarrett, Lovetta Sellu, Moses Habib & Max Kessebeh. My last day, Tuesday 3rd June. I observed Bassie teaching. I joined Joe’s JSS 1 class and started to learn the local dialect – Mende. It has the same 26 letters as our alphabet plus 3 more – ŋ (a nazel ‘n’ phonic sound), ɔ ( an ‘O’ sound as in French) and ɛ (’Eh sound’). Hello – Boa Bisɛɛ (boo ah bee say). How are you? Kahu yeina. (Cowhoo nyayna). I’m fine – Kayein gewɔma. (Kaiyen gorma). Goodbye – Malɔue (Mallo hooay). Goodnight – Mu Kpɔkɔ. (Moo bohkoh). What’s your name? Bi biyɛi. (Bee beeyay) …. Nya biyɛi mia a Laurel. (nighya beeyay me ah …). Later that day the 6 scout uniforms were delivered with 2 neckerchiefs to send to Scouts – Birkenhead 5th. The children swiftly put them on for a photo. I hope all will be completed before the end of term. 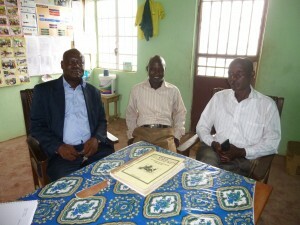 During my visit I caught up with Sam the mines inspector, Sam the lawyer and Alah the private school principal. The long school shut down meant teachers at private schools weren’t paid, no pupils, no income! Such hardship.Everyone suffered due to wage problems, travel restrictions and rising prices of basic foodstuffs. 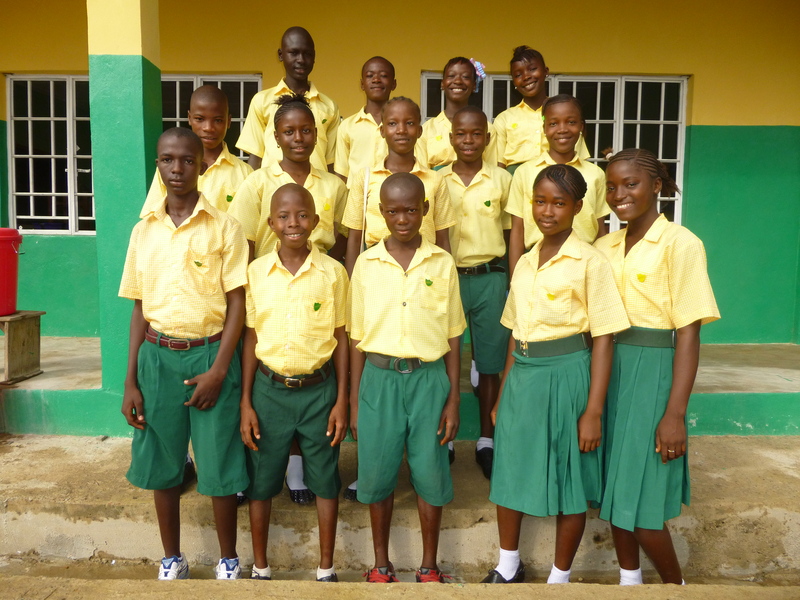 There’s tremendous relief, the return of schools is heralding a return to ‘normal life’. 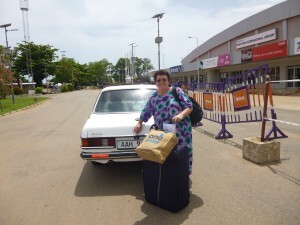 Wednesday 3rd June all packed up and off to the airport at Lungi via Port Loko, avoiding Freetown and the ferry. 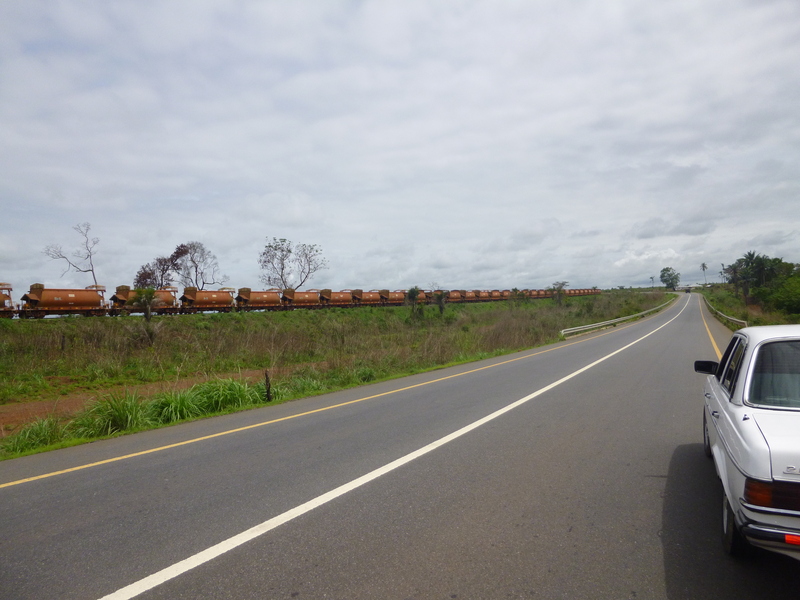 Port Loko is the main area for the mining of iron ore and shipment abroad, the rail network specifically for this industry has massive rolling stock capacity. Huge line of railway rolling stock on left hand side. Trucks for transporting iron ore to the port. The journey was full of stops and starts due to health checks. Each stop meant getting out of the car and hand washing in strongly chlorinated water plus a temperature check. A very well monitored system. The airport where you usually have to wait for ages before check in was processing everyone as they arrived. I was 2 hours early but went straight through the system to departures. It involved a lot of form filling and temperature checks. Ready for home. Always relieved to arrive at the airport in good time for flight. The flight was on time. I sat with a lovely couple, Chris & Adrienne, who were taking their newly adopted daughter Mila home to the States. They were jubilant, excited and nervous all at the same time. An interesting flight. A very long wait at Brussels for the flight to Manchester. More screening at Manchester Port Health. My temperature was low and therefore was taken twice. I’m so cool, ho, ho!! The trip was worth every minute. Moral support was required, the staff were so pleased. Really enjoyed myself. Caught up with everyone and things can now move forward, we’re back on track …… ready for our next stage. Crazy new timetable, NPSE in September and BECE in June. PLUS quest to become Government Assisted. Soon be time for the Atlantic Drifters to splish, splash, splosh their 3,000 miles across the Atlantic …… kick starting our next adventurous development. The trip in November will heavily focus on research and plans for Senior Secondary School. Time to start developing Nic & Margaret’s land. Laurel, June 2015. Published August – took a while to suss the technology!! PS: Crisis school timetable altered at the very last minute in July. No compulsory school during August – this is great for the little ones, not having to trudge through the rain & mud. However, Class 6 must still sit NPSE (11+) 5th September. 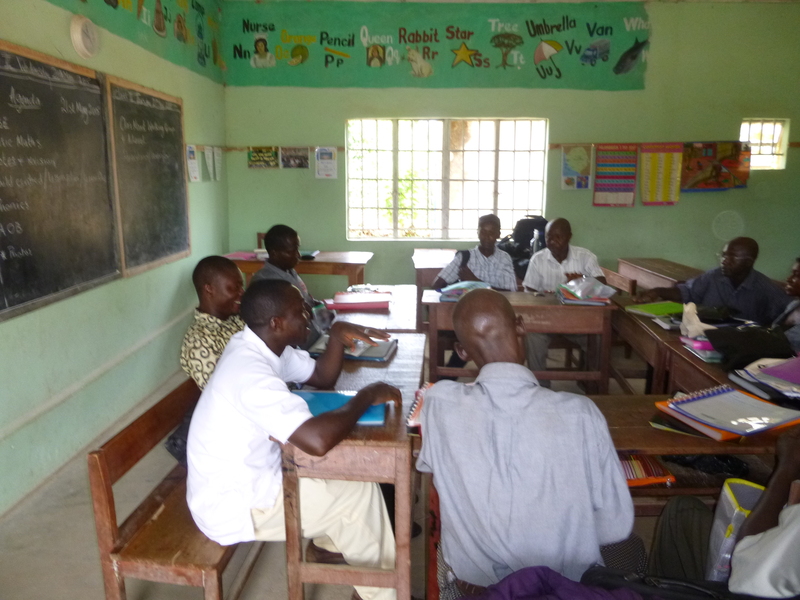 OAKS teachers working hard to help Class 6 as much as possible – cramming the syllabus in August.